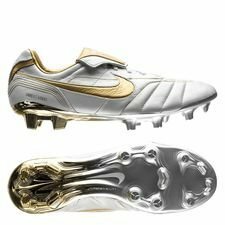 Of the most iconic white and gold boots might be the Tiempo Legend boot, that Ronaldinho got delivered via Joga Bonito TV. Maybe you still remember the epic commercial, where he laces his new boots before going on to a sick crossbar challenge. Nike is now ready with a remake of the iconic boots! You might already think back to the old Nike Air Legend R10, which Ronaldinho got back in 2005, when looking on the new Limited Edition 10R boots. Well, this is not odd, because the new Tiempo Legend 10R is a 1 to 1 remake of the Air Legend 10R boots, but with some small adjustments making the boot ready for 2018. Nike has chosen to merge the best of both worlds, so you get both features from the original Air Legend boot and the more modern Legend. 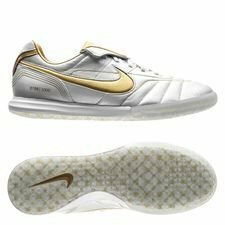 The Nike Tiempo Legend 10R comes with the exact same upper as on the Air Legend, which was released 13 years ago. This offers you an iconic K-leather upper, with golden stitching giving you the same base for a great touch as the master of control, Ronaldinho. Furthermore, you also get the iconic fold-over tongue, which hides a small Ronaldinho logo underneath. Nike has taken the modern Hyperstability soleplate and placed it on the traditional boot, which makes the boot ready for 2018. The studs and soleplate will surely make your ready to control the ball, while dancing around the pitch like Ronaldinho did back in the days. 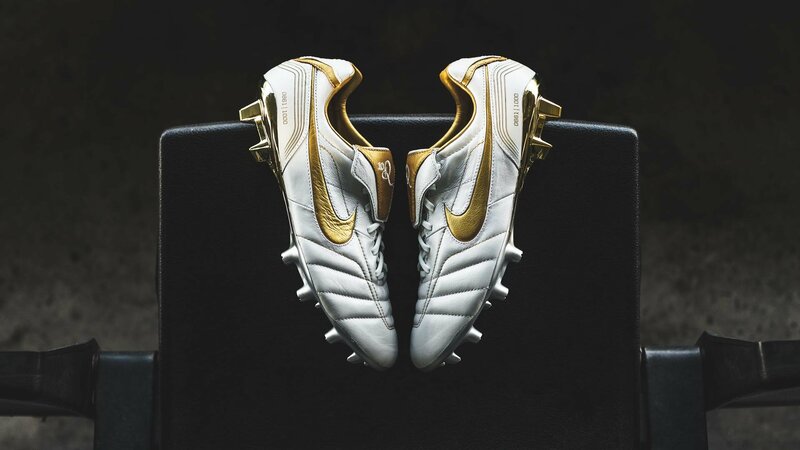 The Limited Edition Nike Tiempo Legend 10R has taken a lot of inspiration from the Air Legend R10’s design. You get the same gold and white design, with golden stars on the heel, while the soleplate has been updated giving you a white a gold combo, to finish off the entire design. Furthermore, the boots will all be numbered, so you should be quick if you would like to get your own pair, since there are only 1000 pairs worldwide! We all know that Ronaldinho was very fond of futsal, and played a lot of futsal as a child, which gave him his technique and joy that he showed in every match he played. As something new Nike has chosen to make the indoor version of the Limited Edition football boot. Tech wise you get the same technologies as on the football boot, but with the soleplate being exchanged with a Lunarlon midsole. The Lunarlon midsole is not an unknown thing for Nike to use, since it’s currently being used on the popular Tiempo Sala II indoor shoes. As something special, Nike has also made the indoor shoe limited and numbered all the pairs, so once again there will only be 1000 pairs worldwide. If you want to get your own pair of the Limited Edition Nike Tiempo Legend 7 10R, or the indoor version, then you can get yours exclusively at Unisport from today! Get your Limited Edition boots right here!